I believe it was sand blasted. I have had no issues with my mug or glasses, and I have been quite happy with them. 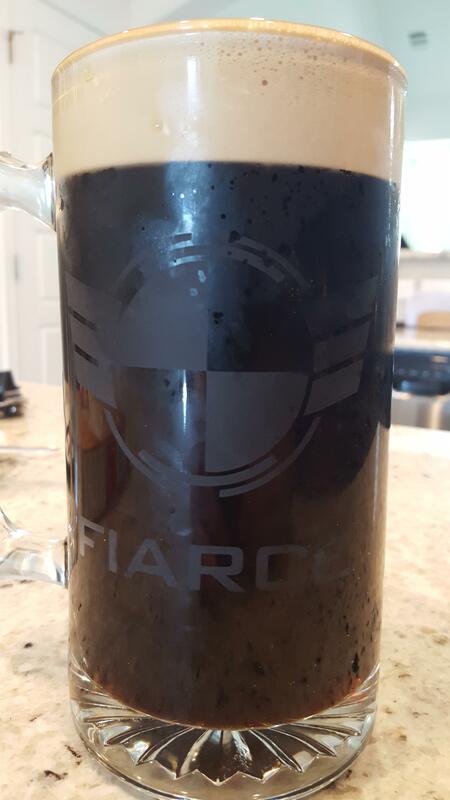 The mug has some weight to it and feels good filled with brew. I have the big ol mug and have not had any issues with it since I had it. I normally hand wash it but it has been through the dishwasher multiple times and unlike other mugs it's very sturdy and no signs of any fading or anything. Perhaps the best mug I have in my collection... And not because it's test labeled. Well maybe the only problem I have is that it gets emptied and doesn't fill itself up. I will have to set aside some coin this week for some then, thank you for the info. I've had a couple of these for about 6 months I keep them in the freezer until I want to use them and they go through the dishwasher semi frequently. I haven't noticed any signs of stress or cracking. It's done with a mini sandblaster not a dremel. The beer mugs are pretty hefty, I'm not sure how easily the handle could crack off? The only issue I've had with cracking is with USPS handling the packages like hockey pucks and breaking everything before arriving to their destination. I do recommend handwashing, however I do know a lot of people just throw these straight into the dishwasher with no problem since they are etched and not a vinyl application. I hope that helps! @NinjaGirl is being overly nice to those assholes at USPS. They screwed up the shipping so bad they literally swept the glass dust into a new box and shrink wrapped it closed - just to say they delivered it. The note from the USPS expressed how sorry they were that these things happen when trying to get everything delivered in a timely manner...great, but my glass dust was even delivered late! FU USPS!! But, @NinjaGirl took care of everything and I have all my glasses and mug, and they're pretty sweet. I said it before, and I will say it again - quite happy! Cracked open a pair of Left Hand Milk Stouts on nitro, poured vigorously as my wife watched the mug fill up she started to tell me it was going to overflow and make a mess...but, I kept pouring vigorously! One of us... One of us. The perfect pour! Well done, Testie, well done. Any news on when the "hats" will be buyable? Are hats something Ninjagirl is working on? Or is that going to be through a different avenue? Looking to order a mug soon, but I can wait a bit if there is more stuff coming! Sorry I don't make hats (yet anyways).. @Montoya is looking into that. Thanks for the info @NinjaGirl. I'm able to do a colored version using vinyl, however, I find that vinyl doesn't last as long as etched glass. I use premium outdoor vinyl, but as with any type of decal, it's not forever, and it can be peeled off if you put it in the dishwasher or scrape it off with a knife or something.. I hope that answers all your questions! PM me if you need any more info! Yes you're fantastic! (I'm OCD too) That answered all my questions. To follow up on the vinyl, is there any kind of coating I can apply over it to make it more permanent and scratch resistant.. and maybe dishwasher temperature safe? Unfortunately there isn't a coating to extend the life of vinyl decals. There's another application that can be used on glasses/mugs, which is a little more permanent.. but I don't have the equipment for it. It's more like a heat press. Just tell him it's for the good of Test and will make you happy! Happy wife happy life..... and happy organiation happy life happy wife... it's a circle of happy.